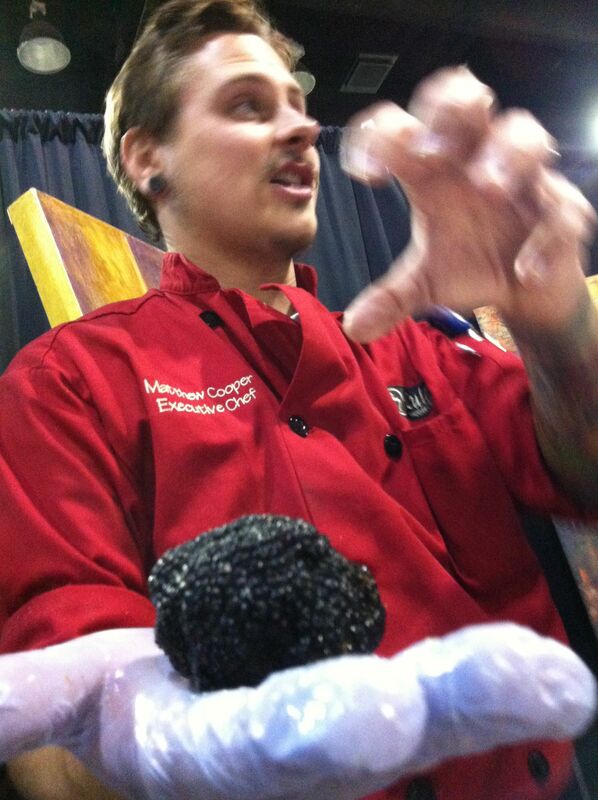 Chef Matthew Cooper of Lulav displays a black truffle earlier in the week at the AHA Culinary Classic. Congrats to Chef Matt Cooper of Lulav Modern Eatery, who won this week’s Iron Chef Arkansas competition at the Arkansas Hospitality Association Convention and Trade Show. I have a particular fondness for this guy because he was one of my instructors at Pulaski Technical College Arkansas Culinary School. He wasn’t a regular instructor, brought in from the field, so to speak, to teach our American Regional Cuisine class in my last semester. He brought a refreshing perspective, still being full-time in a professional kitchen and having an interesting range of experience. 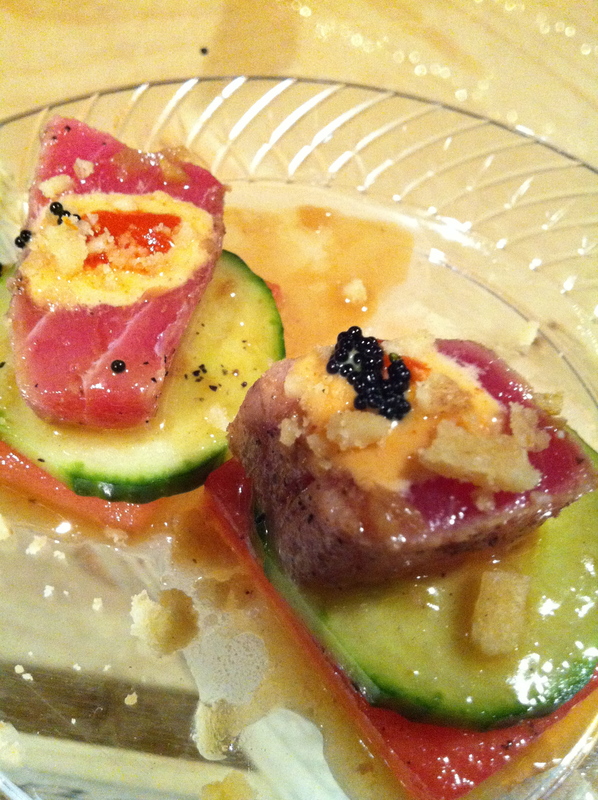 Points for the most creative (and possibly the most delicious and complex) dish goes to Oceans for their tuna tataki. It was served on a watermelon base with fresh cucumber, sriracha, spicy mayo, and caviar. A bit hard to eat, but the combination of spicy, sweet, salty and savory was a bite to behold. On Friday night, I got to experience the Wildwood Wine and Food Festival in a completely new way — as a diner. In the past, if I was at this event, it was as a culinary student, serving up items we had made in class. This year, I got to casually walk from station to station, chatting with the chefs and visiting with friends I saw there. It was kinda fabulous, other than trying to figure out what in the world to wear since I couldn’t wear a chef coat! Having this extra time to savor each dish (or at least study the gluten-having ones I couldn’t eat) also allowed me to learn more about each chef’s philosophy and ways to use different ingredients. I’m sharing some of these items with you in the slideshow below so we can be inspired together. Image from Lewis Curtis' Hell's Kitchen Facebook page. SPOILER ALERT…If you’ve DVR’d last night’s premiere of Hell’s Kitchen and haven’t watched it yet, don’t read this! In an earlier post about the Wildwood Park Wine and Food Festival, I talked about meeting Lewis Curtis, executive chef at Lulav. 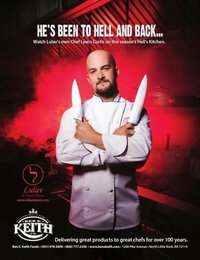 Curtis appeared in last night’s premiere two-fer of Hell’s Kitchen…at least until he was axed in a surprise move by Chef Gordon Ramsay in the last moments of the second-hour episode. At Wildwood, I described Curtis as “delightfully punkish, the one you’ll ‘love to hate’ in the show.” I was wrong. And possibly, in my opinion, it was his lack of ratings-drawing “punk” that got him cut. 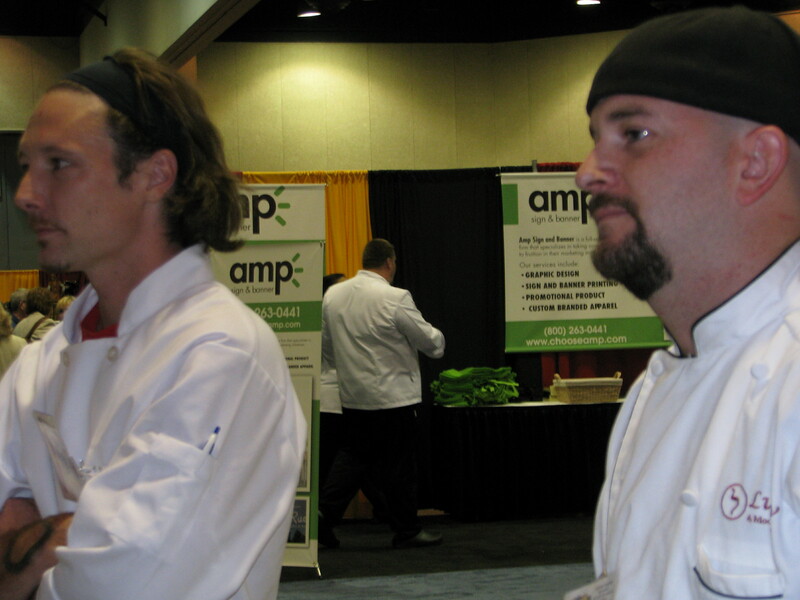 Lulav Executive Chef Lewis Curtis (right) watches Wednesday's Iron Chef competition with sous chef J. Matt Lile (left). Curtis came across as genuine and heartfelt, showing great emotion in the one-on-one interview after his dismissal. He also sounded much more country-fried on the show than he does in person, and I’ve spoken with him twice in the past week. Maybe, just as the television camera sometimes adds 20 pounds, for others it adds a few degrees south of the Mason-Dixon line. The show’s second hour featured a sushi challenge, starting with a demo from none other than (!) Iron Chef Masaharu Morimoto. Curtis never seemed to get the hang of sushi, failing the challenge gloriously. So, of course, Ramsay places Curtis in charge of sushi for the men’s team during dinner service. Would this happen in a real restaurant? Possibly in a teaching kitchen, or on a slow night when the chef wants a cook to learn a new skill. But Curtis was set up for disaster, which was apparent when, two hours into service, he still hadn’t produced a saleable plate of sushi. At the end of the show, three other cooks stood before Ramsay for his decision on who would go home: moronic, bumbling Raj; talented, headstrong Boris; and charming, overconfident Vinny. Ramsay took a deep breath and plucked Curtis from the waiting group, sending him home instead for holding up dinner. As a budding culinarian, I can’t fault the guy. We all have styles in which we’re comfortable, and Asian (at least sushi), obviously, just isn’t his. I’m sad that we won’t see his other talents on the screen. So I guess you’ll have to just go to Lulav and try the food.